I’m working to get back into the mix of the Deeper Learning MOOC, after having a slight detour away from it, and the topic has shifted to Academic Mindsets. The chart above from DLMOOC shows a bit of the thinking in relation to what the term means around how we view ourselves and our work within the academic sphere. I’m all for stepping back and thinking of how we teach and what and where we teach through these lens although (and here I will use the old teacher complaint) the reality is that most of us struggle with the time to actually do that and see this kind of inquiry as a luxury at odds with the typical day. With lesson planning, communicating with parents, navigating shifting curriculum standards, enrichment/intervention, interactions with administration, and more, taking a breath to think through academic mindsets often feels like something easily put to the side in the “now” of the teaching moment that require immediate attention. I appreciate the DLMOOC has not quite forced me, but given me an opportunity, to mull the concept of academic mindsets over. I’m not done thinking yet, either. Consider this post just a marker for now. I have also begun to watch some of the archived discussions on a tool called Zaption, which creates a “tour” of longer videos (so, curated video segments). I like the tool but wish I could add my own thoughts and comments, and felt like I was not part of the conversation. It’s funny how much I now expect that — that I can be part of the conversation. That’s part of my own mindset, I suppose, as a learner myself and as a teacher. I anticipate entry points and get disappointed when they are not available. The video I have been watching is about Academic Mindsets and the Common Core, (with Camille Farrington, Eduardo Briceño, Carissa Romero, and Rob Riordan) and where those ideas might mesh (or not). The main element of the discussions was about assessment and competencies of students over time. The majority of the speakers here seem strongly supportive of the Common Core in connections to nurturing mindsets of students. I don’t know. I see some openings for deeper learning but wonder about how the standards are being integrated and how the standardized testing will assess it. We can talk again after PARCC and Smarter Balance have been rolled out and we see what’s in there. I appreciate the discussions around writing, however, and the theme of “purpose” of learning for the individual student and away from the purpose of standardized testing data points. The last speaker in the video provided some realistic balance, for me, about how to frame learning in the Common Core era, as we move from the hypothetical learning space to the real classrooms. What this discussion around Academic Mindsets comes down to for me is … does the place where I teach my sixth graders every day still enrich my academic mindset and is the environment such that it continues to challenge me as a professional? Are there structures and supports in place for that kind of growth? For the most part, I give a qualified “yes” on that question, but I also realize how much I turn to outside elements (the National Writing Project, online spaces, etc.) for those kinds of opportunities. I suspect that if I did not have those places to turn, I might think differently, and might view my teaching career differently, too. The theme this week over at the Deeper Learning MOOC has been about mentors, apprenticeships, internships and learning in the real world as a part of the learning experience. The DLMOOC Tweet of the Week asked us to remember a time when we were mentored, and two experiences have come to mind. Actually, three. When I saw the tweet from DLMOOC, the first thing that came to to mind for myself was an experience I had a young teenager. I play the saxophone, and music was my main identity during high school. A friend of mine, who was a few years older, was a drummer, and we jammed a lot. He got a job in a Portuguese wedding band, and they were looking for a horn player. I got hired, even though at age 15 I had no idea about playing Portuguese music, had little experience with any wedding music, and … to be frank, I was completely out of league. I could read music fine and I could noodle around on solos a bit. But I was not a “wedding band” musician. Still, the singer wanted me to succeed (the guitar and bass players did not want me there) and he began my quick immersion into Portuguese culture and music, keeping an eye on me and encouraging me when I needed and pulling me aside for private conversations when required (a lot, unfortunately). I lasted four gigs (and made about $100) and then I was asked to leave. I didn’t regret it, nor was I too sad about it. I never got the feel for Portuguese wedding music (the food rocked, though). But the uncomfortable nature of the experience and the guidance of the singer has stuck with me over the decades. Finally, I want to relay an experience that turns the idea of mentorship on its head a bit. It has to do with Minecraft. Now, I know Minecraft is huge with my students, and it has been for years. Although I do an entire unit around video game design, I am still unable to wrap my head around Minecraft. I know it’s me. I have no idea why Minecraft is such a condundrum. Last year, I asked my students about Minecraft, and one student said, “I’ll show you.” He came in the next day, armed with a flash drive of some Minecraft modules that he had built just for me, and then proceeded to spend his entire recess (and the one after that) showing me how Minecraft works. Frankly, I was more interested in the role-reversal of the situation — my student teaching me — than understanding all that he was showing me (he also talked very fast and “showed” me rather than let me play, but ….). How often do we let our students be the experts and admit that we don’t know or understand something? It was a powerful experience for him and for me, and like playing in the Portuguese band, the experience has lingered. Deeper learning requires guidance, and mentors, and experiences that move beyond the books and paper and classroom settings. It’s Vygostky and scaffolding in action in the real world. Most of the educational systems where most students spend their days does not build that in. I know mine doesn’t, and it should. This week, the Deep Learning MOOC began, and so I started in with the first week of possible activities. It’s an open, constructivist MOOC, so you do what you want when you want and how you want. I happen to like it when there are a few steps forward, so I took the suggestions from the facilitators to read a few pieces about Deep Learning principles to get a better handle on what the theme of this MOOC is going to be as it unfolds. First, I read a few articles and even used Diigo’s annotation tool to make notes on this piece by Jal Mehta about Deep Learning and the Common Core, and how the two might fit even as reality intrudes on those possibilities. Then, there was this video (which I have viewed before) about a student’s view of the educational system. I decided to put it into Vialogues and annotate it as I listened, and then opened it for others to add notes (I am going to work on opening up the Diigo to others, too). 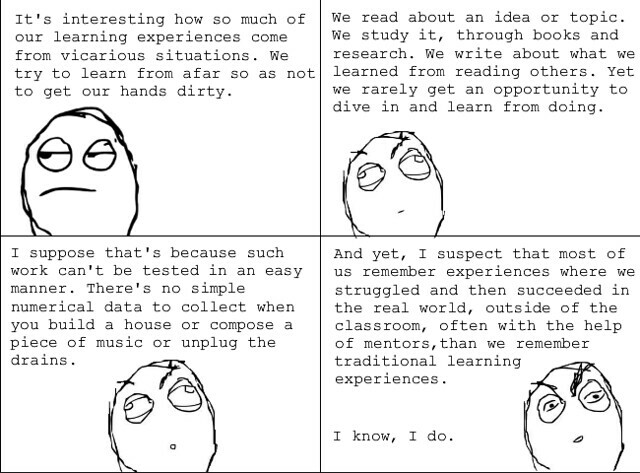 Finally, we were asked to tweet out an experience of our own, as students, when we remember learning deep. I wrote about a time in high school when I collaborated with another student in Jazz band to create a jazz piece for performance. We worked together for long hours, knowing that not only would our peers (the band) be playing it, but that it would become a piece in a performance for a real audience. It was pretty intense learning. I wish I had an audio of it now. Earlier, I had also written a piece for the Deep Learning MOOC Story Bank about another experience with my local chapter of the National Writing Project, where I spent a summer writing and learning about the teaching of writing. 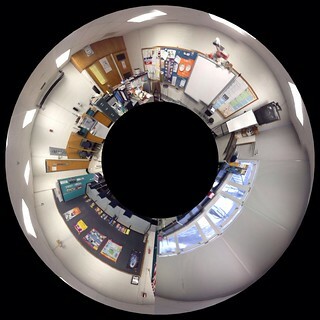 It is a prime example of Deep Learning PD, I think. I’m relatively new to the idea of Open Learning, where technology has opened up new and expanded spaces for people to engage in their passions without the traditional four-wall structure. (And, some critics would say, without the same rigor, too, although that would be a source of intense debate, I suspect.) To me, open learning is a way to dip into topics and communities and go as deep as you want or need or desire, with personal goals guiding you forward. This is not for everyone, obviously, and I toggle back and forth between how engaged I want to be. The thing is, I keep meeting incredibly interesting people in Open Learning environments who stretch my thinking and push me in new directions. We need that in our lives — folks inside our learning trajectory who show us new paths to pursue and new ideas to consider and new schematics from which to observe the world. I shared out the flowchart (which I created in Google Drive) on Twitter (my real hub of online spaces) but then, I realized if I used ThingLink, I could put in links to the communities being references. Plus, as I worked on the links, I realized I could add a bit of humor, too. (ie, the moo and the door and more). I’m dipping my toes into another MOOC — the Deeper Learning MOOC. Or DLMOOC. Come join me?